I’m totally wiped out, and when I’m tired all I want to eat is beef and carbs. Does butter have carbs in it? Anyway, last week I was seriously SERIOUSLY craving tacos. 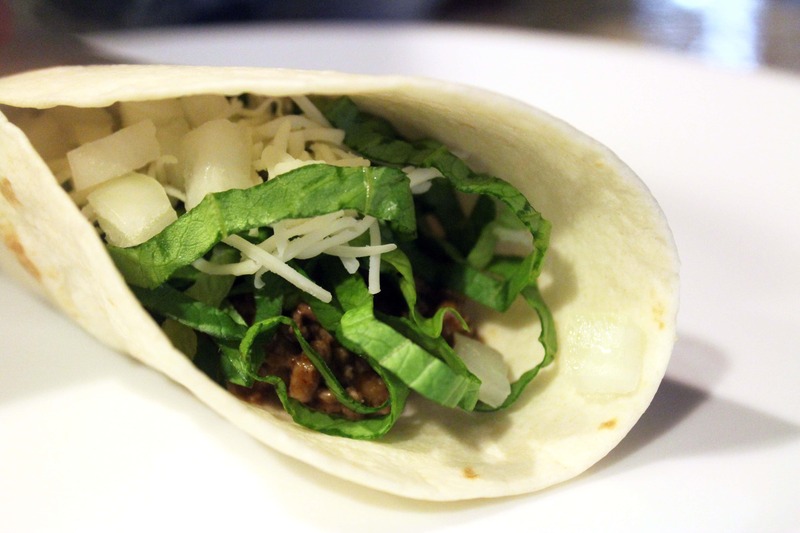 Not fancy tacos with a ton of crap and shredded braised meat and weird flavors. 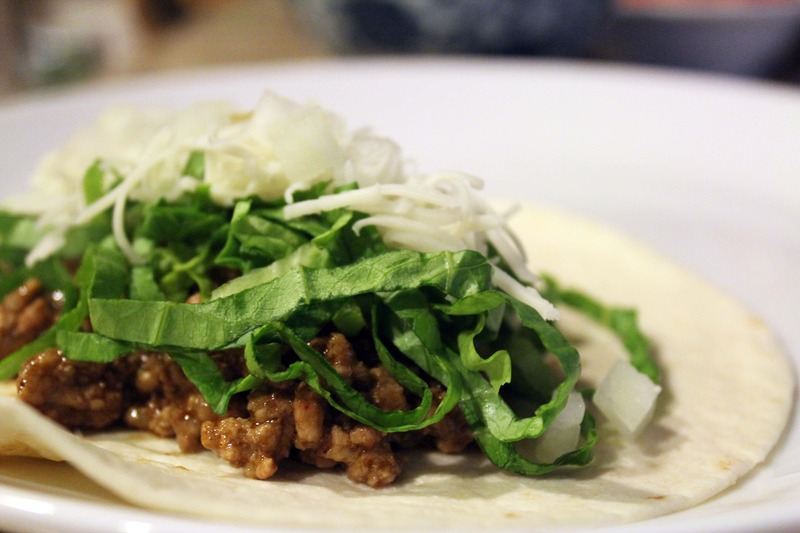 Tacos with ground beef, lettuce, and white cheese. Simple, perfect, and easy. But, I didn’t want to use a packet. BUT, packets of chemicals taste really good, so I decided it was high time I was able to make something simple without a dang seasoning packet. 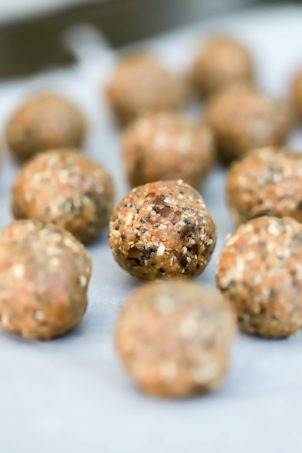 You can of course top these with whatever you’d like – I just got out anything that looked decent in the fridge. The meat, though, is where the deliciousness comes in! So, yeah, I know seasoned salt is kind of like a flavor packet, but give me a break here. 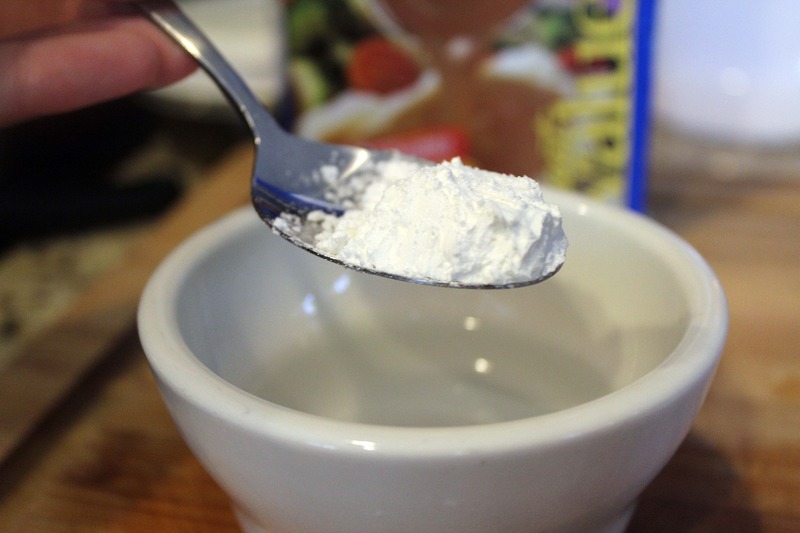 Buy a blend that you like or use plain salt – it’ll still be delicious! 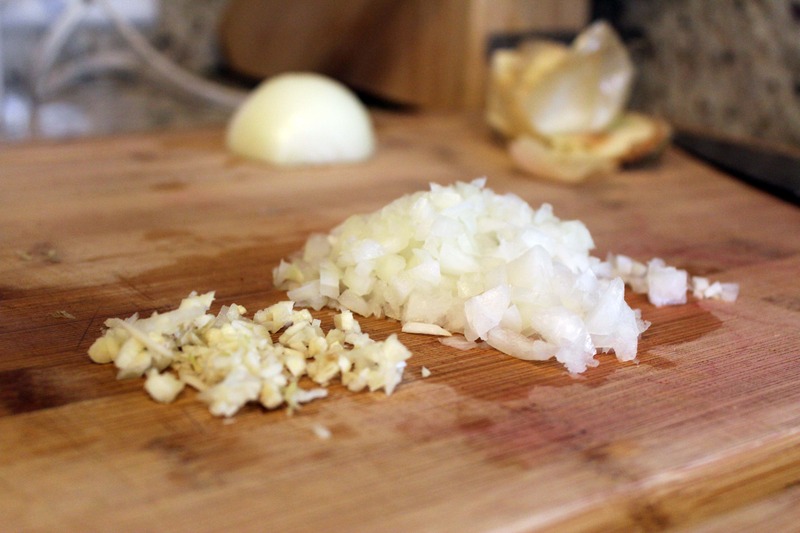 First, finely dice the onion and garlic and preheat a pan to medium heat. 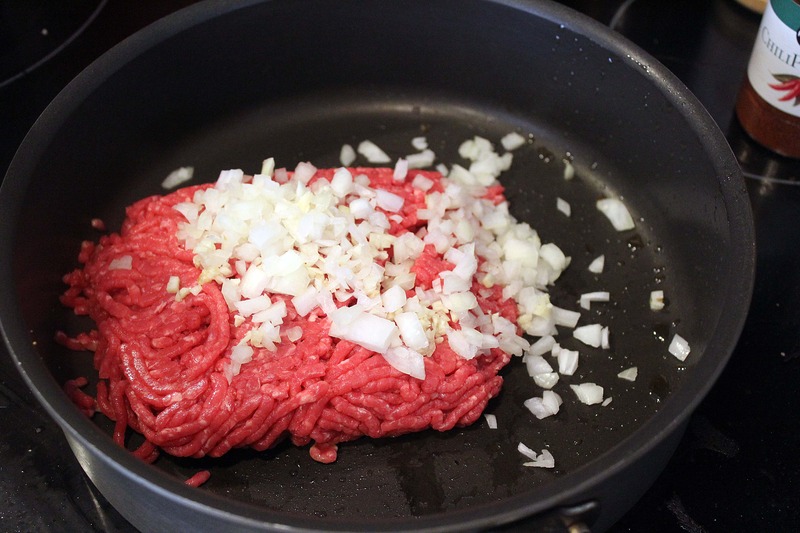 Then, add the raw beef and onion and garlic all at the same time. 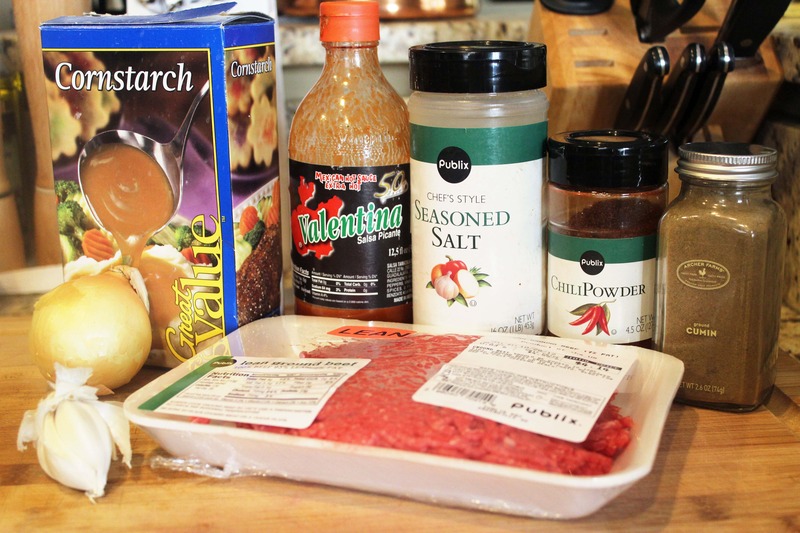 Let the beef cook, and break it up into little bits to incorporate the onion and garlic as it cooks. 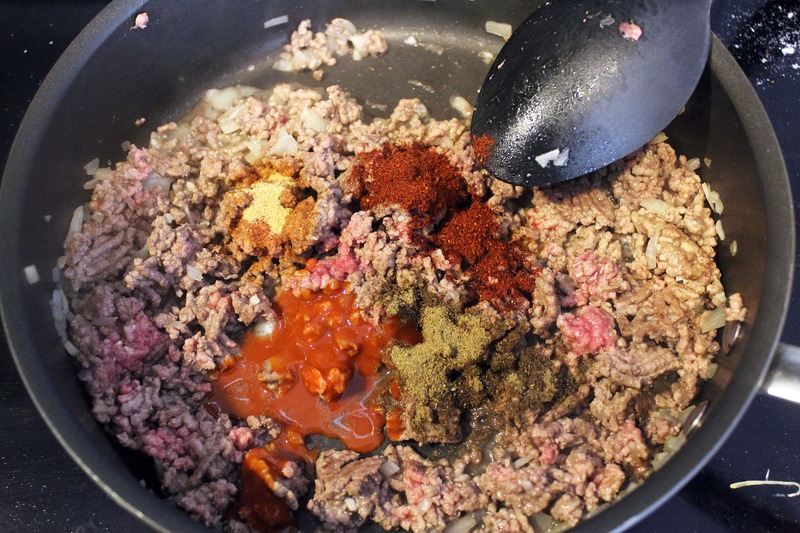 After about 5 minutes when the beef is partially cooked, add the chili powder, cumin, hot sauce, and seasoned salt. Stir the spices into the beef as it continues to cook, and use a spoon and small bowl to stir the cornstarch into the water. 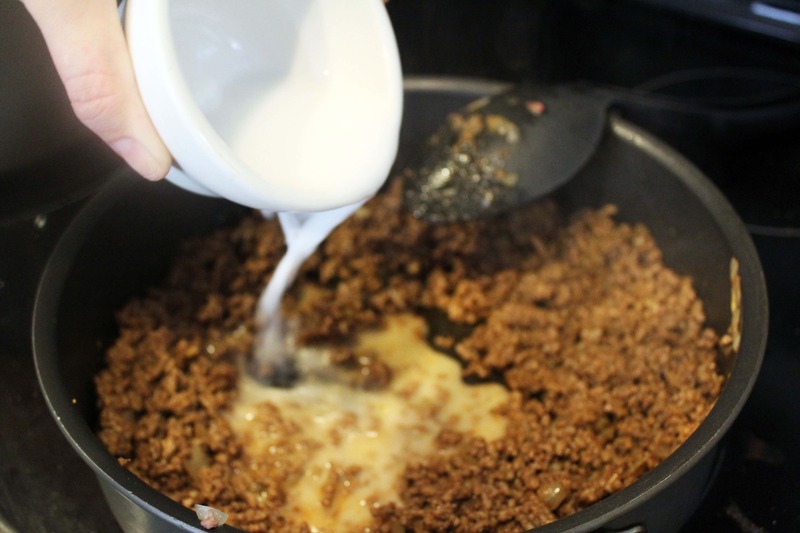 When the spices are fully combined into the meat and the beef is cooked through, pour in the cornstarch mixture. This is the secret! 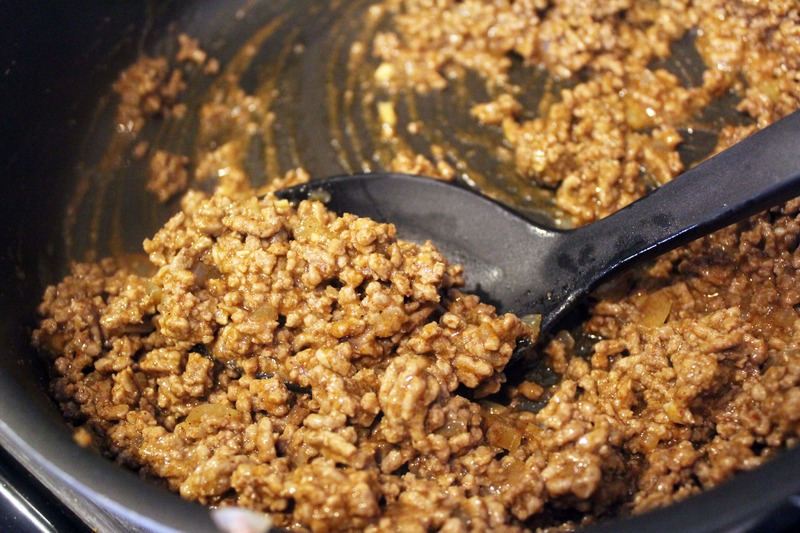 You don’t use enough cornstarch to make a gravy, but you use just enough to add some texture to the beef and spices. Let the cornstarch mixture bubble and reduce for 3 minutes or so, then turn the heat to low. Taste the beef, and add more hot sauce and salt if you’d like. 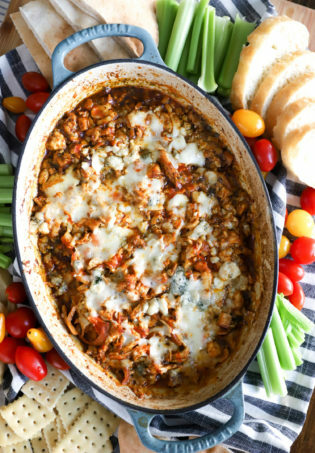 If the liquid completely evaporates, add water 2 tablespoons at a time to keep just a bit of sauce in the pan. 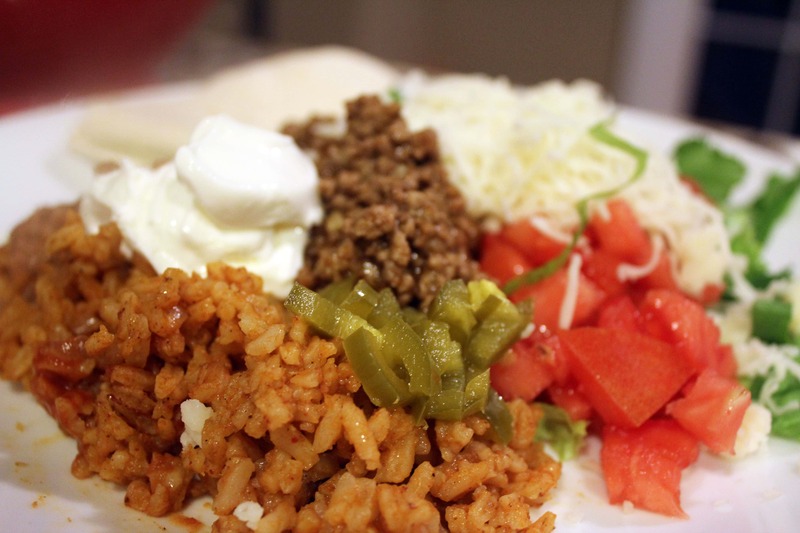 While the beef is simmering, gather any toppings and taco shells or tortillas you’d like to use as serving vessels. Then, build you tacos! I like mine simply with lettuce, onion, cilantro, and cheese. 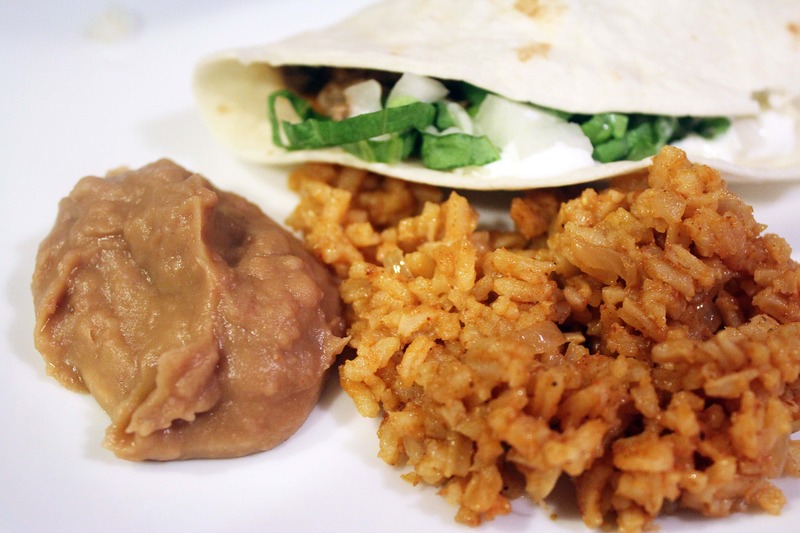 With these homemade refried beans and red mexican rice? I’m a happy girl. 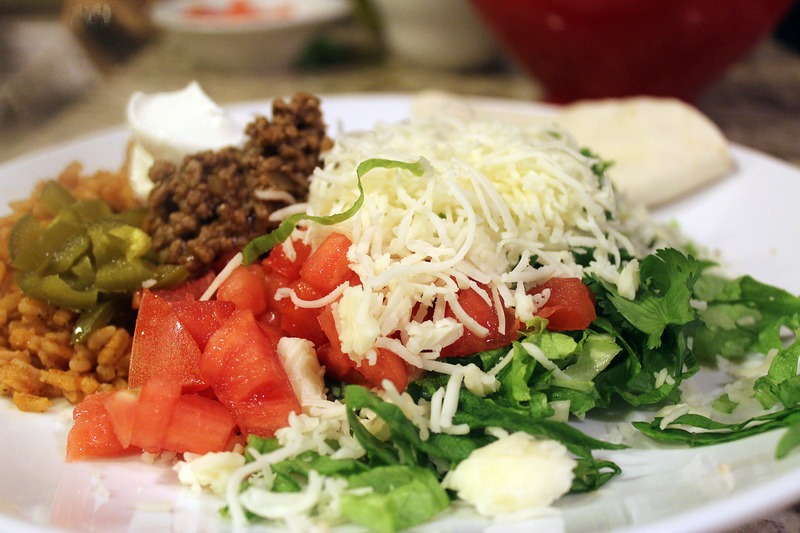 BUT, you could also make a taco plate. 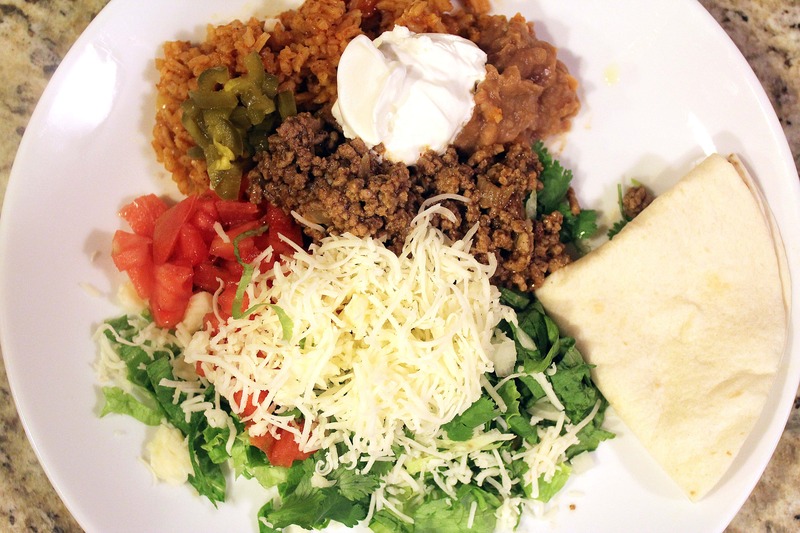 With all your favorite fillings and meat and some folded warm tortillas….how beautiful is that? I eat it halfway with a fork and halfway with the tortillas as spoons. 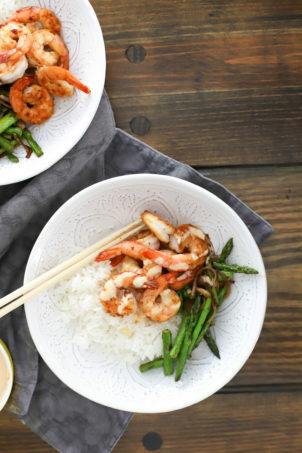 It’s perfect, easy, and so delicious. 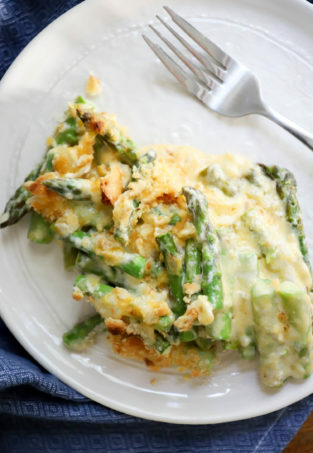 You could also make tons of this in advance and freeze it in little portions for nights that you don’t have time to cook – it’ll keep for a long time! 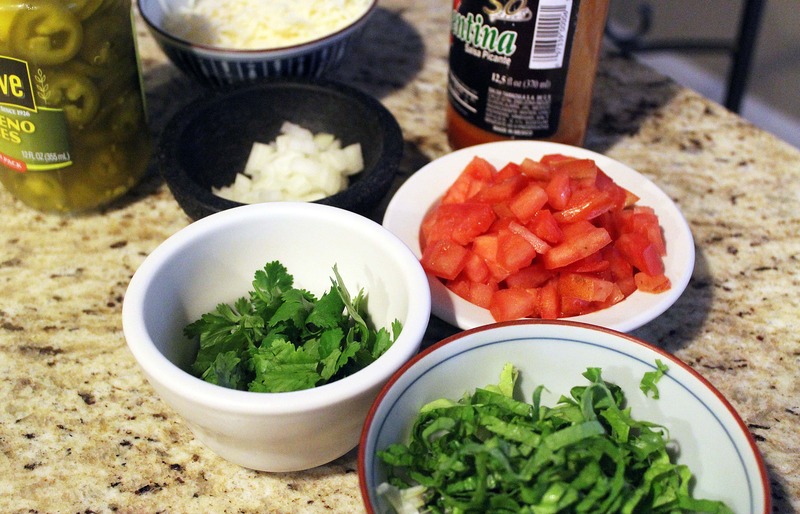 Enjoy this, and even though it isn’t Tuesday…what’s better on a FRIDAY than tacos?